**UPDATE: Our giveaway is now closed. The last counted comment was by Megan Terry. Hello! 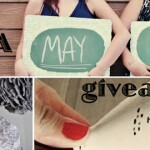 We are so so so excited to bring you a MayDae giveaway today! And we are even more excited that we will have TWO winners! Yippeee! 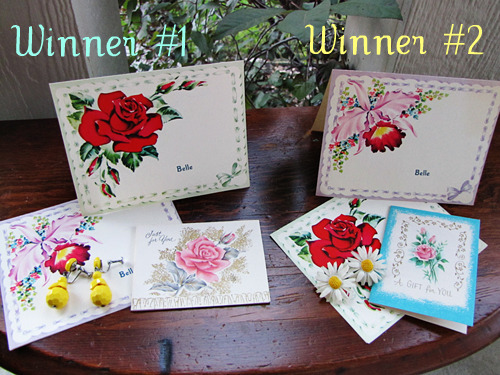 Each winner will receive 2 vintage greeting cards with gorgeous flowers prints, and 1 vintage miniature greeting card (all come with envelopes). 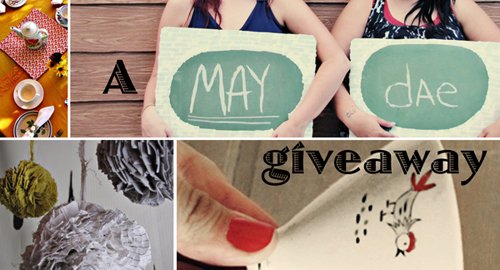 Along with the 3 greeting cards, each winner will receive 1 pair of vintage earrings! 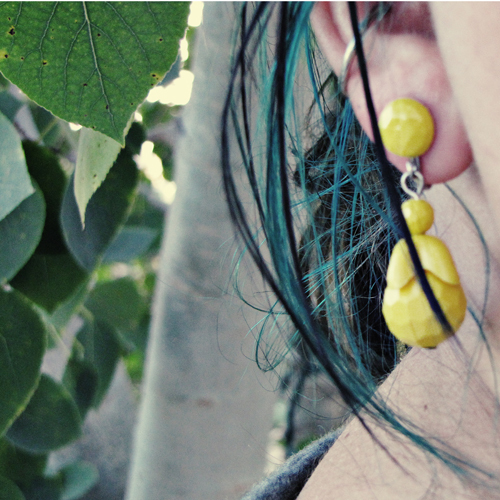 1 pair are yellow dangle earrings, and the 2nd pair are daisies! Aren’t they both so adorable? Love. 1) Leave a comment on this post telling us who you would send a vintage greeting card to! *We will choose 2 winners from the comments. *If you do both of these, you will have double the chances of winning! Our MayDae Giveaway ends Sunday, October 3rd 2010 at 9:00 p.m. (MST) 2 winners will be chosen at random by MayDae and announced here on our blog on Monday October 4th. You may enter 1 time on our blog, and 1 time on Bloglovin. Giveaway open to US residents only. I would send a vintage greeting to my Grandma. To this day she sends out handwriten letters to her family and friends. It would bring her Joy to get mail back. Hmmm…well I swim with a bunch of ladies at the Rec Center that are all at least 25 years my senior. These notes would make for a good conversation piece. What a blessing and honor to sit down with these ladies and listen to their ‘stories’ of times past. I would send a card to my wonderful daughter-in-law! I would send one of those wonderful cards to my Grandmother and My awesome Aunt :) ! Those cards are sooo beautiful! I love anything vintage! I would send a card to my grandma! We love to write letters. I would send one to my mom, who appreciates getting greeting cards more than anyone I know. 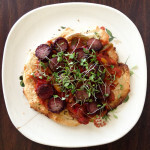 Following on bloglovin! I would send those to any of my family as a thinking of you kinda thing. I would send one to each of my two best friends! i would send it to my grandma! I would send one of these sweet cards to my godmother, who just lost her father. I think it would brighten her day! I would send on to my grandmother. These are beautiful. I would send one to my Nana! I would send a card to my best friend who is in Paris studying for a semester! I miss her so and she would love these! I would send a card to my sister. She loves vintage things! I would send one to my sister! I would love to send a card to my mom! I would send a note to my beautiful mother, who LOVES anything handwritten. She has a file of all the lovenotes, poems, school papers, and such that all of her kids and grandkids have done over the years. I would also send a note to may amazing Aunt Lee who has been like a second mom to me – a tremendous godly woman who has been a huge influence in my life. HI! Those are absolutely beautfiul! I send lots of mail to my mother in law, so that is who I would send those beautiful cards to!! 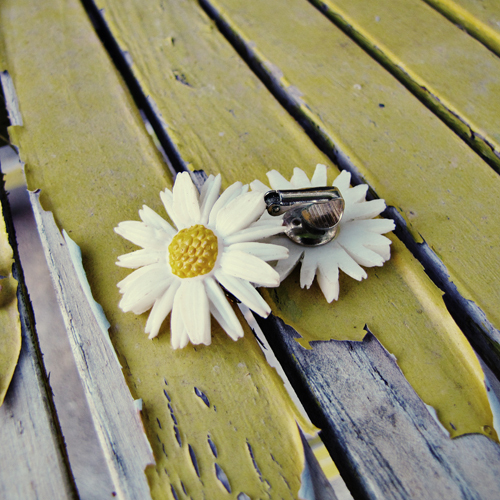 Love your vintage stuff! I would send one of them to my great friend in Cheyenne, WY. and one to my friend in South Africa. –Get this giveaway free exposure here! These are so lovely! I would send one to a friend from work that is recovering from surgery and I would save one to send my mom on my birthday next year, along with a bouquet of flowers!! I would send one to my husband. he lives in NY during the week and I do not see him. i miss him desperately and it would be fun to mail him a Love Note!! I would send the card to my 4 year old niece. As you know, kids love getting mail! She would love the beautiful flower cards along with the cute earrings. I would send one card to my sweet friend Tara and another one to my precious cousin Chrystal who works so hard and does ministry at the same time. You girls are so amazing, your creativity never ends. I would fill out the cards and put in them “You are a special person” and if I was somewhere and saw a person that was feeling down I would hand them the card so they could have something beautiful in their life. Everyone deserves to have a card with gorgeous flowers on the front. I would write to my aunt on one of your beautiful vintage cards. aww, i would send one to my lovely friend natalie in london :) thanks for the chance to win! Aww, thanks for hosting this. I would send one to my sister. She’s still in high school and hates that I live farther away from her now. In fact I’d probably give her the earrings too to brighten her day! I would send a card to my best friend from high school who just had her first child! My Grandmother just sent me a fabulous card and hand made apron that her mother made in the 50s. I was just thinking about getting some cute stationary so that I could send her a card back. I would love to surprise her with one of these beauties! I still write letters to mom and to Lisa B.
I would send this to my parents and to my friends. Everybody likes getting mail – and I love to put a smile on their face. I will be sending one and one and one and one to my cousin(s) in Canada, Thunder Bay and Calgary. They like pretty things too. I have a friend that I’ve been writing letters back and forth for 21 years – who does that? And we live 20 minutes away from each other and both own phones and computers, lol. We started (at 15 years of age) by making our own cards with hand drawn, very mod looking girls on the front, and used the exercise to perfect different forms of penmanship. Now, our favorite thing is to look for the most odd/funny vintage cards/postcards (and pretty ones) and send them to each other, usually with a note folded inside – we just can’t bare to mar them. But I know (if I won them) she’d be most appreciative if I include them is part of her birthday gift in November. Thank you for the lovely opportunity! 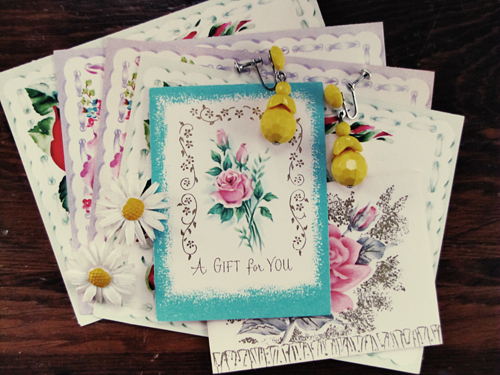 I would send one to my best friend who I don’t see very much- these cards are gorgeous….and those earrings= fabulous. I would send the beautiful card to my grandparents overseas! I would send one to my sister who lives in Florida. I miss her dearly and know she would appreciate the vintage card as much as I would. I have many friends who are huge fans of vintage items such as I am so…I would wait till I found some cute little vintage find and send the card with my surprise thinking of you gift to one of my besties. I would send one to my mom – she loves vintage cards and needs a little bit of cheer! Well- these are awesome! But I wouldn’t send my cards myself! I am hosting a women’s retreat for moms of special needs children in a couple of weeks and if I won this prize, I would use it as a door prize at the retreat for those wonderfully deserving moms! Thanks for the giveaway!